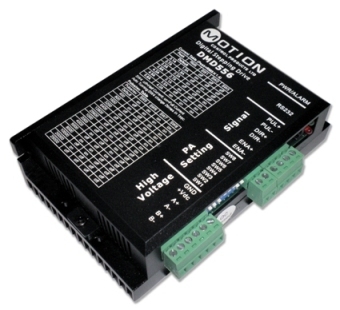 The high performance DMD556 digital stepper drive results from the use of new, patented 32-bit DSP control technology. Each DMD drive calculates its own natural system frequency and applies a damping control algorithm for superior anti-resonance. It drastically reduces motor noise by up to 70% of its original value, together with more benefits such as low speed ripple smoothing and low motor heating. The drive has a programmable resolution from full step to 102,400 steps per resolution. The DMD556's Multistep function allows this full microstepping resolution to be applied to a standard 200-step motor, so system performance becomes smoother. This DMD556 drive is ideal for the applications in packaging, printing systems and machines, such as laser cutters, laser markers, high precision X-Y tables, labeling machines and so on.